Fame and obsession collide in this darkly twisted novel from an incredible new voice in suspense.SOMEONE IS WATCHINGWashed up teen star Liv Hendricks quit acting after her beloved younger sister inexplicably disappeared following a Hollywood party gone wrong. Liv barely escaped with her life, and her sister was never heard from again. But all this time, someone's been waiting patiently to finish what was started...FOUR MISSING GIRLSNow fifteen years later, broke and desperate, Liv is forced to return to the spotlight. She crowdfunds a webseries in which she'll pose as a real-life private detective--a nod to the show she starred on as a teen. When a mysterious donor challenges her to investigate a series of disappearances outside a town made famous by the horror movies filmed there, Liv has no choice but to accept.FOLLOW THE WHITE WOLFLiv is given a cryptic first clue: Follow the white wolf. And now a darker game is about to begin. Through social media, someone is leaving breadcrumbs to follow. As Liv makes increasingly disturbing discoveries, her show explodes in popularity. 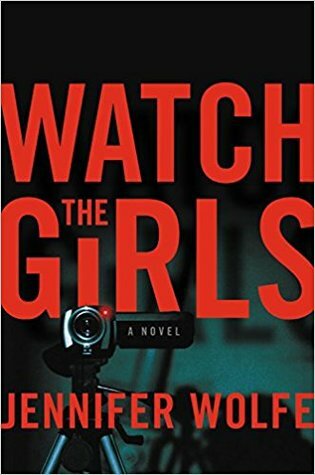 A rapt internet audience is eager to watch it all--perhaps even at the cost of Liv's own life...Filled with provocative twists and turns as the line between plot and reality blurs in this inventive tour-de-force from breakout writer Jennifer Wolfe. This is EXACTLY how a thriller is done! Jennifer Wolfe nailed it! Watch the Girls is a wild and suspenseful ride that will have you hanging on to the edge of your seat the entire time. You will struggle with the desire to fly through the pages to see how it all ends and the desire to slow down and savour the story. Jennifer Wolfe introduces us to Liv Hendricks, a former teen star who is still struggling over the disappearance of her sister, Miranda, 15 years ago. At her financial breaking point, Liv is forced to enter the spotlight again. She decides to start a crowdfunding campaign for an investigation-style web series. A mysterious donor makes her an offer she can't refuse. He asks her to go to Stones Throw, a place famous for its horror movies filmed there, to investigate a series of disappearances. We are then taken down the "dark road" of Stones Throw and thrust into an eerie and disturbing web of events. Buckle up! Liv Hendricks was a fantastic main character. Despite some of her decision-making, she is a very likable character. Watch the Girls has a small character cast, making it an intimate experience with the time you spend with each one. You grow to like(or dislike) characters easily. The book is told from Liv's perspective but delivered between the past and the present. Two stories are unfolding here: What is happening in Stones Throw and What happened that night Miranda disappeared, 15 years ago. Wolfe's delivery of these 2 storylines is flawless. She pens two thrilling and suspenseful narratives, each as equally heart-pounding as the other. She crafts a unique reading experience, winding through multiple theories and whodunnits, but nothing will prepare you for the jawdropping ending! I loved every single minute of this book. If this is what Jennifer Wolfe has up her sleeve, I cannot wait to see what else she has in store for us! Jennifer Wolfe, you better be high-fiving yourself, because you nailed it! Thank you for reviewing! Gotta add this book to my must-buy list!